The latest iPad Mini is a bit of a time traveller. From the outside it looks like a visitor from the past, harking back to the days of larger bezels and buttons. On the inside, though, it’s a much more modern beast. Fans of the iPad Mini had given up hope of seeing a new model. It’s been nearly 4 years since the iPad Mini 4 appeared and Apple looked as if they had given up on the smaller format tablet in favour of larger phones. In March, without any fanfare, Apple announced a new Mini and Air model iPad to the surprise of many, refreshing their line up for this generation. The new 2019 iPad Mini, which Apple are simply calling ‘iPad Mini’ but everyone else is calling the iPad Mini 5, boasts the same A12 Bionic chip found in last year’s flagship iPhone X and this year’s XR model. It’s far more up-to-date than the Mini 4 was at launch, which is good to see. The A12 in the Mini runs at the same 2.4GHz rate as last year’s flagship phone and Apple claim that it’s 3 times faster than the iPad Mini 4, which is no surprise considering the age gap. What it does mean, though, is that the new Mini is no slouch and can whizz through any task with ease. The A12 processor also features a ‘Neural Engine’ which means it can learn tasks and use this to improve speed or take better pictures and help with Augmented Reality. In practice, I ran intensive apps on the device without it breaking a sweat, including Playerunknown’s Battlegrounds and Fortnite that both push the graphics processor hard but thanks to the M12 co-processor they both ran really smoothly. Switching between multiple apps using Apple’s recent OS updates to support better multitasking was also smooth thanks to the 3GB RAM in the new iPad. One thing that remains the same is the resolution. The new iPad Mini keeps the 2048 x 1536 resolution, giving it the highest pixel density of any iPad at 326 ppi. It’s pretty much perfect for the 7.9″ screen size, giving you clear text and a great picture. The enhancements come from the wide colour gamut and True Tone, that help provide better colours and whites between them and the 500 nits brightness level, which is a step above the last model and helps make the tablet readable even in bright sunlight. Like the Mini 4, the new model has a laminated glass front with no air gap, making it far easier to read text and helps make those colours pop. One addition that is welcome is that the new iPad Mini 5 supports the Apple Pencil. Like the other non-Pro iPads this supports the Apple Pencil first edition rather than the newer one. It means you still need to take the magnetic lid off to charge the pencil and that you need to charge it in the lightning port of the tablet or remember to carry around the lead with you, though you can buy some good third party charging stands as well. The pencil functions well on the smaller screen, even though there’s less space and it feels a little more cramped but the advantage is that you can hold the tablet with one hand and draw with the other if you want to. This is one area where Apple have decided to keep things the same. The new Mini is pretty much indistinguishable from the last model or even the model before that. It has the same dimensions, 203.2mm by 134.8mm by 6.1mm, and the same rounded corners. The most surprising design choice is to keep the bezel thickness the same in a world where these are shrinking with every generation. Thankfully, they’ve decided to keep the headphone port but the legacy port decision does also mean we get to still use a lightning cable instead of the USB C of the new Pro models. It looks like it will be a few years more until USB C becomes standard in all new iPads. While it’s easy to initially feel a little disappointed by the design choice, looking at the competition in the 8″ tablet space there’s little else out there doing anything different at the moment and it does mean that the iPad Mini 5 is easy to hold by the bottom bezel while reading, a task that it’s perfectly designed for. With a renewed focus on magazines and newspapers thanks to Apple’s News + app, the Mini could well be finding itself well suited to the task of becoming your window in to the daily news and regular magazine reading. How does the new iPad Mini compare to the rest of the current line-up, then? Well it’s as fast as the new iPad Air and faster than the 2018 iPad while both the Pro models obviously have them all beat (but also cost a lot more). All the new non-pro models feature bezels and Home buttons so it’s in good company there. All of the new range have Pencil support, too, with the mini providing a more portable home for artists. 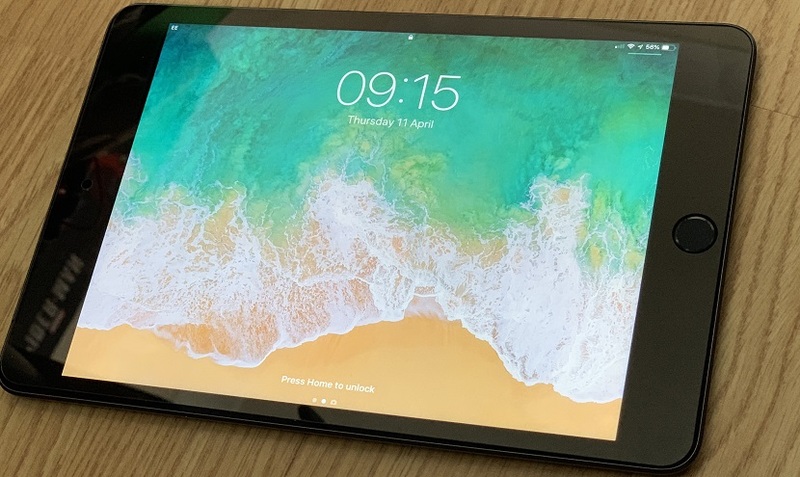 It beats last year’s 9.7″ iPad with a Fully laminated display, True Tone and P3 Wide color display, as well as an anti-reflective coating that makes it more suitable for using outside. So while the iPad Mini 5 looks, from the outside, like a bit of a blast from the past, it turns out to be more of a blast of fresh air for the smaller tablet and makes it the new ideal carry around device. With a good starting price; £399 for the 64GB base model, fast processor and Apple Pencil support it’s certainly worth a look.